THE ROMANY LIFE: Our Huge Solar Install AT LAST! The Big Reveal! Our Huge Solar Install AT LAST! The Big Reveal! Technicians get to work on our big girl. Look at that pristine, empty roof space! Our new solar system has been completed, and we have had an opportunity to put it through it's paces a bit. WOW are we happy with it! We waited several months for the opportunity to have AM Solar install our new solar system. The usual wait time for an installation can be several months. We did our research and this company won our business. While there are many solar installers out there these days (MOST with a much shorter wait list) we wanted what this company offered. 1. They are an established company in a very efficient shop. While there are independent installers out there who work remotely, we wanted the security of knowing we could go back to our installers for more work or any issues that came up, and they did come up. When you are dealing with such complicated and cutting-edge technology, there are bound to be hiccups. More on that later! 2. 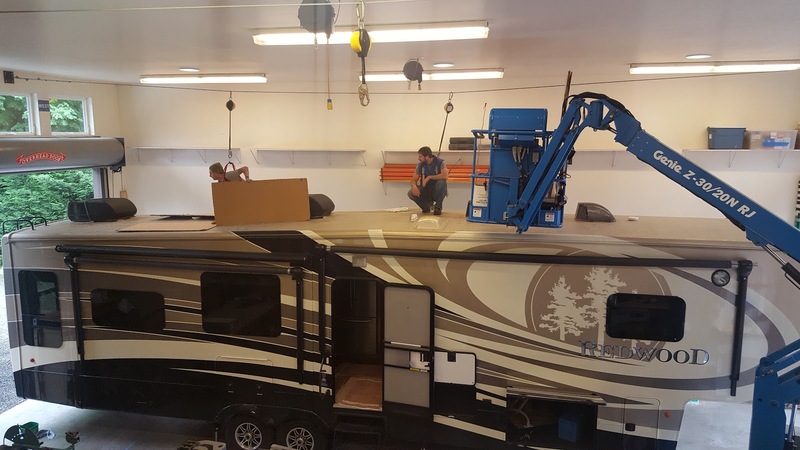 They work directly with component manufacturers and have innovative solutions for common problems that face RV installations specifically. They are very familiar with the fickle nature of RV's and have mitigated some of these weaknesses. They understand the challenges presented with weight, location and aesthetics of installing a large solar system. 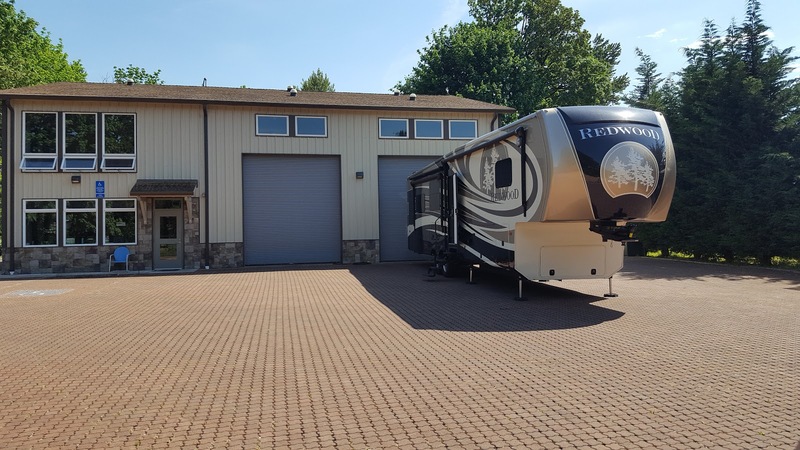 They also have a good understanding of how fulltime RVers typically use their power systems, and can more precisely guide you in the right system for the way you live. These systems are not cheap, and it is great that they do not try and sell you more than you need, while at the same time counseling you about the realities of using solar. They are realists. We love that. 3. They intend to stay in business. Obviously this is very important to most people. When something goes wrong, they will be there to help. They assured us that they would always be available to answer our questions or help us trouble shoot any issues at any time, and we know where they are and how to get a hold of them. 4. 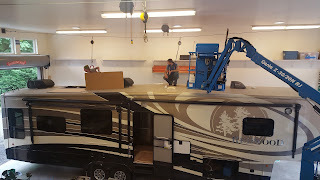 The founding owner of the company is a fulltime RVer! Now maybe this is sort of trivial, but it speaks volumes to us. To date, his motor home has more panels on it than any we have ever seen anywhere. Pretty cool. Boodocking at AM Solar the night before our install. We arrived the night before our appointment and boondocked in their lot. They are very hospitable to this, and had a 50 amp hookup and fresh water for us if we desired. Unlike many in the country who come to this location, we are only a 3 hour drive away, and so we were able to drop off our RV for the installation which took about 8 days. Yes, EIGHT DAYS! It was a big job! It was so exciting after waiting so long and trying to visualize how great it would be to have almost complete independence for power whenever we wanted it. We chose to get a very, very large system installed. All told: We have ten 160 watt panels sending energy to four lithium batteries giving us a total of 800 amp hours of power. That's a LOT. While we still need to be prudent about consumption, especially because we have a residential refrigerator, we can live nearly in a normal fashion, using a dishwasher, a washer and dryer, and even one air conditioner. Amazing. On the morning of our installation, we met with the install team and we went over the details of what they were going to do, and they asked us questions about our preferences on various things. They are great listeners and you absolutely feel appreciated and respected as their customer. You have access to a fantastic lounge area with refreshments, Wifi, bathrooms, and lots of reading material if you desire. 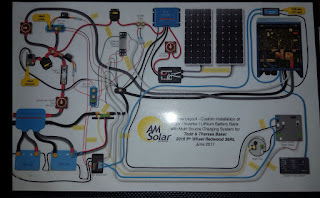 They also have a fantastic array of system components that you can study and learn how much you do NOT know about solar power! And check this out: They gave us a killer schematic of our system. Whenever a technician needs to service our coach for any reason, and needs to work with the electrical system, we can show him in clear terms how it was wired and how it works. INVALUABLE! Finally pick-up day arrived. We spent the entire day with them while they finished up a few last minute items, and then the tweaking began. There were things that didn't quite do what they were supposed to and those were remedied. We were given a careful and extensive orientation of our new system and what it was capable of. They also presented us with a fantastic visual map of our system and all of it's many components, which will be invaluable if we have someone working on our electrical system. It feels amazing to have the ability to dry camp anywhere and have the luxury of nearly our entire coach's amenities. If we do not have the benefit of sun, then we can use our on-board generator to fill up our batteries until we do. We are extremely pleased with AM Solar and recommend them without any reservation!